Making sure your Flexi-Coil equipment is ready to go when the season is right involves a few simple checks and adjustments, says Steve Mulder, Flexi-Coil Sales and Marketing Manager. “Flexi-Coil’s qualified dealer technicians look at everything from the condition of the hoses to the gearboxes and drives. If anything is worn or faulty, it’s replaced,” he says of the pre-season service program. There are also some general rules operators should follow to ensure all seeding equipment such as air kits, carts and bars are in good shape. “A few simple checks and adjustments don’t take much time and they ensure your equipment works properly and you’re much less likely to run into problems. A couple of minutes spent checking your equipment before use could save you a lot of time and expense once the season is underway,” Steve says. Check wheel hubs for loose nuts and check tyre pressure. Check wheel bearings and repack and adjust if necessary. Check tyne mount bolts for looseness, but do not torque the bolts beyond prescribed limits as it will result in premature bolt failure or nuts continually coming loose. On newer, large tractors, check and limit system hydraulic pressure to ensure it’s no greater than 2600 psi. Keep hoses the same (or similar) length to balance air within the hoses. Keep primary hoses in a straight line or ensure bends curve slowly and evenly. 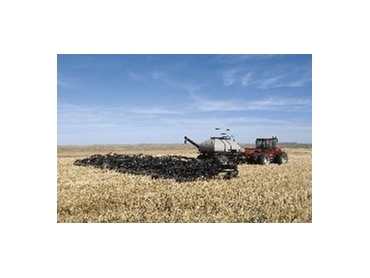 Use the outside runs of the air cart metering system to deliver grain to the centre section, and the centre runs to deliver material to double fold or outside wings. Never plug a single port in a head. Either change the head or use the purpose made divider.